This morning I did a solid workout, and my mom and I prepared a super easy, Paleo breakfast. Inspired by Pinterest, did not turn out as picture perfect, but was yummy nonetheless. 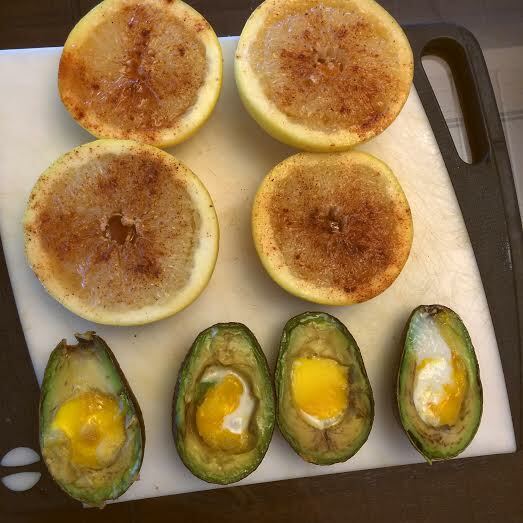 Egg baked in half an avocado, and broiled grapefruit! cut ripe avocados in half, and simply crack open an egg where the seed goes. I take out half of the yolk, and put in as much of the white as possible. Bake at 425° F for 20 minutes; we put ours in our little toaster oven. Cut grapefruits in half, then we sliced around the edges and criss crossed to make it easier to spoon out later. Then smother about half a tablespoon of honey, sprinkle with cinnamon and nutmeg. Broil them for 5 minutes.